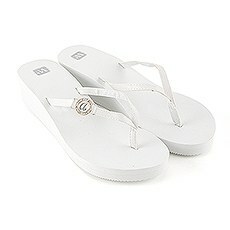 Flaunt your perfectly pretty pedis with our comfy flip flops. Our flip flop sandals are available in several splendid styles including white "XO" embossed, black or white "Just married" flip flops for the bride and groom, or personalized pretty wedge flip flops.Purchase the white "XO" embossed flip flops for your bridal crew, or take advantage of the great bulk prices and give them away as inexpensive party favors. Your guests will welcome a nice break from their heels! The sweetly adorable "XO" pattern is playful, fun and is a perfect match for a beach or a warm weather wedding! Have them put their feet up to let those around them know that this is the "Best Day Ever" on the flipside of these flip flops.Or choose from our black or white "Just Married" flip flops. These contrasting colors are cool and comfortable - and a perfect way to let everyone around know that you were just married. Ideal to pack away on a honeymoon, these his and her sandals have fun, contrasting black and white prints and get the happy newlyweds in the mood for serious fun in the sun, sandy beaches and palm trees. The soles of these festive sandals have "Just Married" script that leave imprints in the sand.Or choose to personalize your pretty wedge flip flops with a lovely custom silver charm embellishment. These cushiony wedge heels measure 1.5" and are pretty enough to dance the night away in, wear with your wedding dress or give away as gifts to your bridal crew. These flip flops come with gift packaging.Our pretty bridal sandals provide a unique and fun gift for everyone on your list! Give them something that they will use long after your wedding is over and they have gone home. These thoughtful sandals offer long lasting comfort and are a perfect addition to any gift basket, party favor bag or table top decor!